Good morning and happy Labor Day to those of you here in the US! We hope you enjoy this week's Make It Monday video, brought to you by Betsy! –Create a project utilizing your take on the challenge. 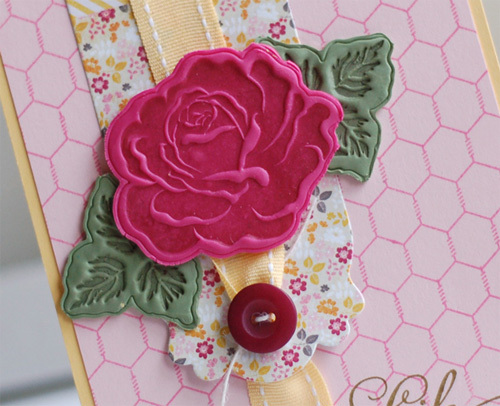 Your project must use at least one Papertrey product and a hand-made clay embellishment. –You will have until 7am, Monday, September 10th, to add your link to the list to be eligible to win. And you can enter as many times as you like. –One randomly selected winner will be chosen from ALL the entries on Monday, September 10th, after 7am. The winner will be posted here on this blog post, on Twitter and Facebook. The randomly selected winner will get a $25 PTI gift certificate to spend however they like! Congratulations Angela Person! You have been randomly selected to receive a $25 PTI gift certificate to spend however you choose! Please send a note to customer service with the email address you would like the gift certificate sent to. And thank you to EVERYONE who played along with this week's challenge! Thanks for another fun challenge. I really had to labor on this one. I had to find my clay. I really like this one. I probably need more dies and stamp sets that match. Beautiful, Betsy! Love how thin you got clay, and to use it with dies! 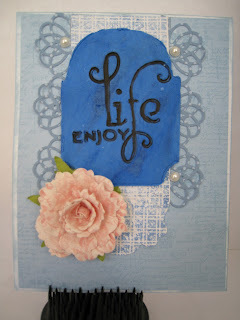 I have made clay embellishments using moulds – I just used white clay and coloured them after with mists and paints. I would really love to know where you got the floral patterned paper. Thank you so much :). 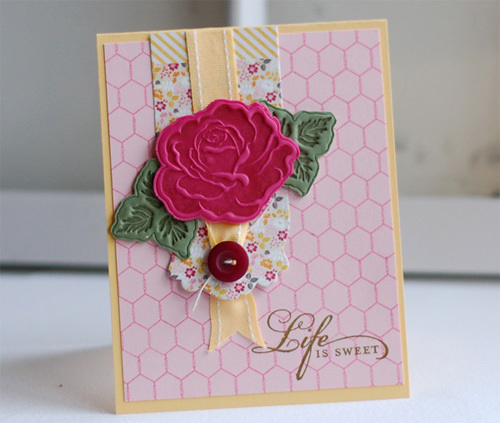 Gorgeous card by Betsy! Great video tut! Wow…you are amazing Betsy! Another amazing layout and great new medium…thanks so much for sharing! super idea and video! TFS… something new for me to try. Thanks! Clever idea with the clay!Maybe it’s just my laptop screen but I could swear that color is Lemon Tart and not Harvest Gold. But regardless of what color it is I love this card. What a great idea with the ribbon and button! Love the technique, how simple and pretty. These cards are sooo much fun. Great job. Can’t wait to try out the ideas. Beautiful! One can never have enough stamping toys! they turned out beautiful, such a great idea and love the design of the card too!